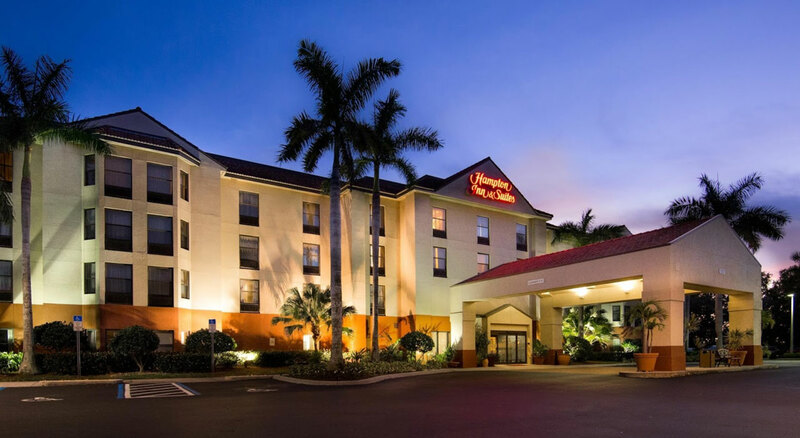 Welcome to our Hampton Inn & Suites Fort Myers Beach/Sanibel Gateway hotel. Ideally located at the crossroads entrance to Fort Myers Beach and Sanibel-Captiva Island, our Fort Myers hotel offers the perfect place to relax with your family and discover a coastal paradise. Stroll down seven miles of stunning beaches, or choose from a range of fantastic opportunities including fishing, shelling, and shopping. Explore the Lynn Hall Memorial Park and Pier or visit the Matanzas Pass Wildlife Preserve. Enjoy the fantastic nightlife in this thriving town and be sure to visit our team at the front desk. We'll be happy to help guide you to a fun adventure. Enjoy comfort and convenience at our friendly Fort Myers Beach hotel. Make yourself at home in a comfy guest room or suite featuring a flat-screen TV, lap desk and free high-speed internet. Start your day right with Hampton’s free hot breakfast offering a variety of delicious buffet items, and make sure you try our famous waffles. If you’re in a hurry, grab a healthy Hampton On the Run® Breakfast Bag as you leave the hotel. Catch up with work in our free business center, or host an important meeting in our Ford Executive Meeting Room. Rejuvenate in our fitness center or take a refreshing dip in our heated outdoor pool.